Start, Renew or Update Your eForms Wizard Subscription Today! 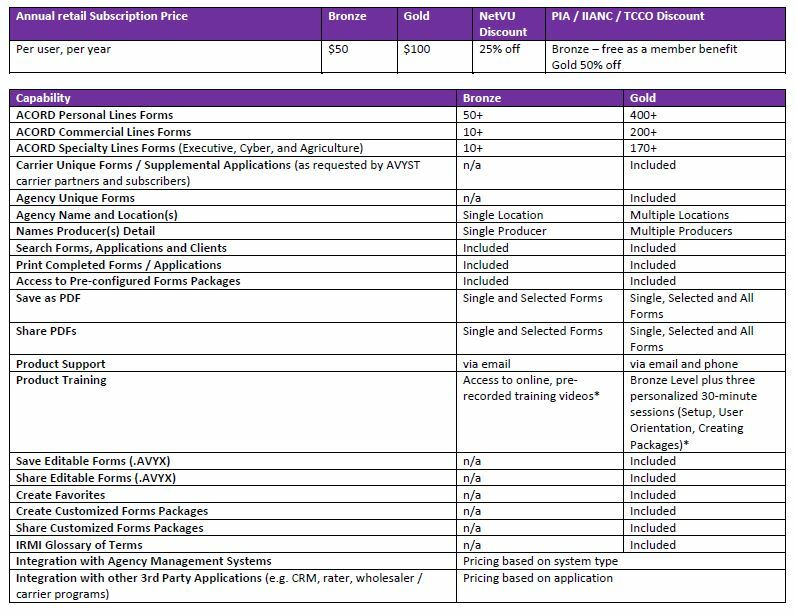 Discount Pricing is available for members of the following AVYST Partner organizations. Please click on the appropriate link to generate your custom pricing invoice. Trusted Choice of Colorado, Inc.
Retail-priced Subscription, click the appropriate Buy Now button. Please note that AVYST uses Authorize.net for credit card processing so PLEASE CHECK YOUR SPAM OR JUNK FOLDER as you will be receiving an auto reply with your order confirmation and a link to download the software. If do not receive the email, please contact AVYST at 877-204-0407 (option 2, sales). All Subscription Sales are final. People Love eForms Wizard GOLD! "AVYST e-forms Wizard provides a single entry point for quick and accurate on-site or in-office applications that are portable without the bulk of your entire management system at an economic price ALL agents and brokers can accept." —Clifford M. Golub, Clifford M. Golub Associates, Inc.
All services and software provided by AVYST are provided “AS-IS.” To the maximum extent permitted by law, AVYST disclaims all warranties, express or implied, including the implied warranties of non-infringement, merchantability, and fitness for a particular purpose. AVYST makes no commitments about the content within the services or software. AVYST further disclaim any warranty that (a) the services or software will meet your requirements or will be constantly available, uninterrupted, timely, secure, or error-free; (b) the results obtained from the use of the services or software will be effective, accurate, or reliable; (c) the quality of the services or software will meet your expectations; or (d) any errors or defects in the services or software will be corrected AVYST specifically disclaims all liability for any actions resulting from your use of any services or software. You may use and access the services or software at your own discretion and risk, and you are solely responsible for any damage to your computer system or loss of data that results from the use of and access to any service or software. If you post your content on our servers to publicly share through the services, we are not responsible for: (a) any loss, corruption, or damage to your content; (b) the deletion of content by anyone other than AVYST; or (c) the inclusion of your content by third parties on other websites or other media.